Today’s blog post comes with kind permission from the team at Giffords Circus. Taken from the circus’s founder, Nell Gifford’s summer newsletter, you’ll find out about all their exciting news. 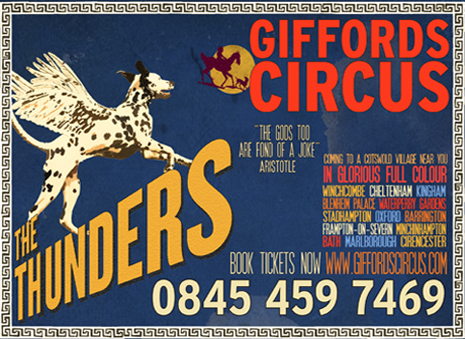 JoJo founder Laura Tenison is a huge fan of Giffords Circus and highly recommends it. And with only a few more weeks left of the Thunders Tour, make sure you catch them while you can. I think that the tent interior looks beautiful. The inky blue lining covers all the inside so that daylight is shut out and the tent becomes a magical complete space out of time and place. The olive trees and painted clouds are lit by flickering candles and the band seem to float in their togas, their faces shining. I love it in the tent and for the first time I feel that it is almost a complete and perfect picture. In 2013 we dedicated our tour programme to the Syrian village of Deir Ba’alba. I read an article in which the journalist, AA Gill, visited a refugee camp in Jordan and a man approached him and asked him to name his village, this village Deir Ba’alba, because every single person in the village, every family, every child, had been killed, so that the village essentially did not exist any more. On the 20th September the 7pm show at Fennells will be in aid of the UNHCR. The money raised at that show will be given to them to help their work with the refugee crisis. Please try and come to this show – it is also a kind of house warming celebration of Giffords Circus arriving at Fennells Farm, with a hog roast afterwards.